I started this post a few days ago when I was in Mexico City, but I just couldn’t get it finished while I was still away. My itinerary was completely disorganized. I had made no advance plans, read no guide books, and put together no list of must‐sees. So I was just winging it, and between all the winging, I found little time for writing. So rather than doing a chronicle of my 2 1/2 days in La Ciudad de México (or just México, which is how the locals refer to their capital city, or in writing, “CDMX,” which you see all over the city, on taxis and pedicabs, on official buildings, on tourist kiosks, and on the temporary ice rink they erected in the Plaza de la Constitución, as you see in the photo above), I’m just going to share a few experiences and my impressions of what I saw and did. Consider this to be a random wandering around a small part of Mexico City — which is exactly what my trip was. My purpose in planning this getaway was to have a getaway. I originally planned to spend the entire week in Tepoztlan. But my flight home on Saturday was at 9:55 a.m., and it’s 90 minutes to the airport from Tepoztlan. So I realized I’d be better off coming up to Mexico City the night before. But then I thought, why not come and spend a few days there? So I cut my time in Tepoztlan to 4 nights, and booked 3 nights at an airbnb in CDMX. I’m so glad I did, because I loved it! But it started to feel less like a getaway and more like a sightseeing vacation. So I decided not to do much sightseeing. Instead, I walked a lot and enjoyed the sights, the sounds, the smells, and the crowds in the Centro Histórico. My airbnb was in the perfect location, midway between the Plaza de la Constitución (also, or better, known as Zócalo) and La Alameda Central, a lovely park with the stunning Palacio de Belles Artes. My apartment was in the back of a old renovated building. It wa a beautiful apartment, and because it’s in the back, it was very quiet. Outside, this was the most crowded, frenetic city I’ve ever been in. If you’ve ever been in New York’s Times Square, you still have no concept of how much traffic (both cars and pedestrians) Mexico City has. You stand in crowds at the corner waiting for the light to change (and the walk signs are these cute animated green stick figures that walk, and when the light is about to change, the stick figures start running). When the light finally changes, you try to go, but there’s a zillion people in front of you and another zillion people coming toward you. You’re lucky if you make it across before the light changes again. I took this photo while I was waiting to cross Avenida Lázaro Cárdenas, near the Palacio de Bellas Artes. I was one of the first to arrive at the intersection and was standing at the front. The light must have stayed green for the cars for 4–5 minutes. There were six traffic cops waving them through, just at this one intersection where the cross street is pedestrians only! There were just as many people waiting on my side of the street. Imagine what happened when the light changed and everyone met in the middle of the street! It might help to zoom in to see just how big the crowd was. And the noise! My Airbnb host in Tepoztlan told me that Mexicans are loud people. There is noise coming from everywhere all the time! Here is a video I shot at another intersection. Noise, crowds, and traffic cops doing their job. And on Thursday evening I went for a walk and recorded this video. It doesn’t capture how loud everything was, but you’ll get a good sense of how much sound there was. It might seem impossible to have a relaxing time in all this hubbub. But because I didn’t push myself to do any sightseeing, I was able to go with the flow. I only went to one museum, visited the Palacio Nacional, and went into the Cathedral and into random churches and shops and markets. And I spent some time in Alameda Central, which was sometimes crowded but never chaotic. CDMX has a Museum of Architecture, but I didn’t go in. 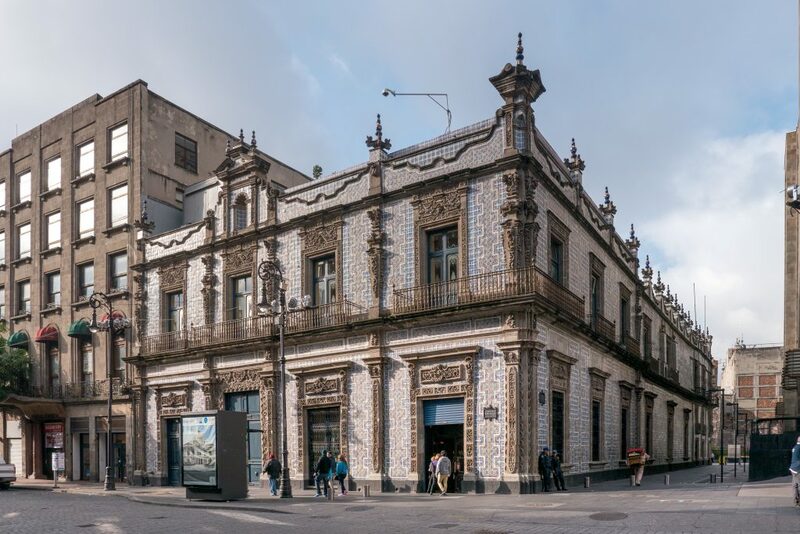 Walking around the Centro Histórico is like walking through a full‐size museum of Spanish colonial architecture, with a large dose of other influences as well. The temptation to take a picture of every building is strong. The ones that aren’t churches (there are a lot of churches!) have been in many cases converted into museums. There are supposedly more than 150 museums in the city, and they may well be packed into this one neighborhood from what I can tell. But as I said, walking through the area is like being in an open‐air musuem, so I don’t really feel compelled to visit museums, at least not on this short visit. 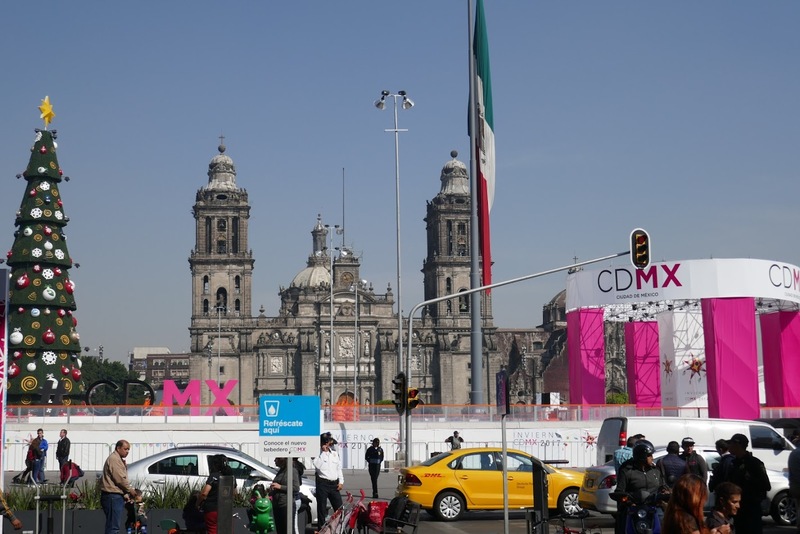 I do know that I will come back to Mexico City and spend more time so I can really explore more thoroughly. I can’t tell you what most of these places are, but here’s a small sampling. Casa de los Azulejos (Tile house), an 18th‐century palace. Since the early 20th century it has been the flagship location of the Sanborns restaurant chain. Mexico City has many murals. Of course the most famous of all Mexican muralists is Diego Rivera, and the one museum I went to was the one that has his mural Sueño de una tarde dominical en la Alameda Central (Dream of a Sunday Afternoon in the Alameda Central), a 15m‐long mural painted in 1947. This is a fascinating piece filled with images of real and imaginary people, historical and present‐day, famous and ordinary. It was fun looking for the characters in the mural (there was a numerical key in the room), but most of them are not people I would recognize. Frida Kahlo is just to the left of the skeleton (“La Calavera Catrina”), and just in front of Frida is a young Diego. Elsewhere are Hernán Cortés, Benito Juárez, and Porfirio Díaz. But the Rivera murals at the Palacio Nacional were, for me, more powerful and evocative. I got chills viewing several of them. The Spanish conquest of the Aztec empire was a horrific event. It took only two and a half years, from 1519 to 1521, which is astonishing when you consider that the Aztecs had one of the world’s greatest civilizations, and was led by Hernán Cortés. Eleven of Rivera’s murals on the second‐floor balcony surrounding the main patio depict the pre‐Hispanic era, showing agriculture (rubber, maize, cocoa) and other aspects of life. The final panel in this series shows the arrival of Cortés. The most important mural is in the stairway leading to the second floor balcony. This is called “The History of Mexico,” and it illustrates the various struggles of the Mexican people against foreign and internal enemies. In the center is an eagle with a snake in its mouth standing on a cactus. This is the national symbol of Mexico. It is based on a legend that the Aztec gods told them to build a city where they spot an eagle on a cactus eating a serpent. The spot where they supposedly saw the eagle was where Mexico City now stands. Here’s a monument celebrating the Aztec people coming across the eagle. This monument is about a block away from the National Palace. I was delighted to catch a couple of lovers in the act! Around the city, in places you might not expect, I found other murals by other artists. “The Holocaust,” by Manuel Rodríguez Lozano. This is on the top floor of a three‐story market located in a restored 18th‐century building. Omniscience, by José Clemente Orozco (1925). It is in the main stairwell of Sanborn’s flagship location at the Casa de los Azulejos (see the photo of the building’s exterior above). The best food I had in Mexico City was simple street food. Tacos reign supreme. I didn’t get to any of the top‐rated restaurants in the city. There are two famous restaurants with Michelin stars: Pujol and Quintonil. And walking into a random restaurant is a crap shoot, I discovered. The size of the crowd can be a helpful (but not always reliable) indicator, but overall, none of the actual restaurants where I ate was especially wonderful. They were, however, very cheap. I had an all‐you‐can‐eat Chinese buffet for the equivalent of $5 US. I had Veal Milanese with sides and a beer for $12 US. And you could buy street tacos for a dollar and a liter bottle of water for fifty cents. There is also a very popular bakery or pastry‐shop chain with two nearby locations called Ideal. I say “very popular” because it was always filled with people, and I was constantly seeing people on the street with huge wrapped packages from Ideal. So I went in to buy some. I took a tray and some tongs when I entered, then wandered around to pick something. Other people in there were loading up tray upon tray upon tray. I got three pastries. I brought them to the “wrapper,” who gave me a ticket with the total price. When I seemed confused, he told me to go a a cashier to pay, then come back to pick up my pastries. I paid (a total of $1.50 for three very large pastries) and by the time I got back to the “wrapper,” all my pastries were wrapped in a bag. The thing is, none of them was very good. Tacos, I tell you. Eat tacos. There are market stalls set up in the streets and squares all over the city. I also visited Mercado San Juan, where, according to Lonely Planet, all the restauranteurs in the city go to buy ingredients. There was seafood, meat, and poultry and all kinds of produce, some of which I didn’t recognize. There were herbs and spices and cheese. Free samples were offered, and aggressive vendors tried to get me to buy stuff. The best market I went to was La Ciudadela Mercado de Artesanias. I’m not sure how much time I spent there, possibly close to two hours (part of which was eating lunch there). I think in that time I covered maybe a third of the place. There was all kinds of great handcrafted stuff from all over Mexico. And I found a nifty little vase to add to my collection (in addition to the two I’d bought earlier in Tepoztlan). I am a member of an LGBTQ Travel Bloggers group on Facebook. When I posted there about Tepoztlan, another member mentioned that she was just in Tepoztlan and now in Mexico City. I responded that I was heading to Mexico City, and we made plans to meet. She was staying with a local friend some distance outside the center, and they both met me on Thursday for lunch. There is a definite advantage to meeting someone who knows a local. He took us to a great taco place and to the best churros and chocolate place in the city. Heather and I enjoy tacos. I don’t remember the name of the taco place, but it was great. Extremely casual, and yet the waiters were all in white shirts and black bow ties. Heather, Roberto, and I eating churros at El Moro. We also had Mexican hot chocolate. Oh yeah! Pretty much every street in the Centro Histórico is named for a famous person or a signficant date. I came to realize how little I know about Mexican history. I’ve heard of Cinco de Mayo (though I’d venture a guess that not many people in the USA know what happened on that date). And I’ve heard of some of the historical figures, but I have no idea of their signficance. I don’t even know when Mexican Independence Day is. In high school, ninth grade social studies focused on Afro‐Asian cultures and their history. Tenth grade was European History, and eleventh grade was US History. Never did we cover the rest of the Americas. I had so much to learn when I did my South American tour in November. Fortunately, our various tour guides provided a lot of the context. But traveling on my own in Mexico, I should have done some reading in advance. Before my next trip (and there will definitely be a next trip! ), I will. Incidentally, on May 5th, 1862, the Mexicans defeated French invaders in the Battle of Puebla. And Mexicans celebrate their Independence Day on September 16. On that date in 1810, Roman Catholic priest Miguel Hidalgo y Costilla rang the bell of his church in the small town of Dolores and gave the pronunciamiento (call to arms) that triggered the Mexican War of Independence from Spain. The war ended, and actual independence was achieved, in 1821. Every big city has its dangers. Traveling involves taking risks. That’s why I wear a money belt. I stay hyper‐aware when I’m in a large crowd where there are a lot of tourists. I can’t say, based on my own experience, whether Mexico is more or less dangerous than anywhere else. But I can say this: People I have talked to all over the world have the same or greater fear about traveling to the USA as we have about traveling to their countries. Wherever I went in Mexico I saw families enjoying the holidays. And wherever I go, whenever I go, it’s the same. People all over the world are just enjoying themselves. And that’s what I will keep on doing when I travel.